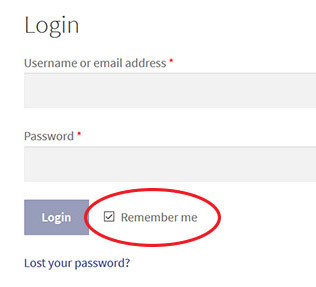 b) If you’re on a trusted computer, you might try checking “Remember Me” before logging in. Doing this will allow single-click shortcuts to be created straight to your map! Do not do this on a public computer. 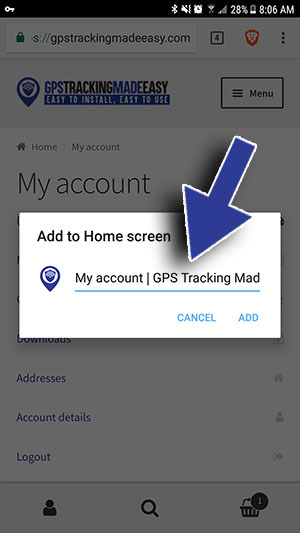 a) Click “My Devices” to access your maps. There are of course other things you can do while in your account by using the other links there. If you only have one tracker from us, you will be directed straight to your device’s map. However if you have multiple devices with us, you will first be taken to the device list table. 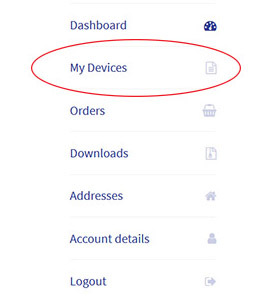 To view a device, click its Device ID. To give a device a nickname, click the “Rename” button. Type the desired name into the box and accept. Here is the map screen. By default, the map will show the most recent location from the database. This is the purple arrow. If your device has been off for some time, the time and date shown under Location Last Updated will be well in the past. The arrows under the map allow you to quickly navigate in “steps.” A step is just a location in the database. So “Back 1 Step” may really be more of a leap if the previous location entry was hours or days ago. Back 10 Steps finds and displays the location that is 10 location entries back from the currently displayed location (which is the red arrow). Forward 10 steps acts the same way, though if you’re not back in time enough, jumping ahead 1 or 10 location entries might give a No Data error. Refresh the map to return to the most recent location logged. It’s easy enough to play around with the arrows while paying attention to the time stamps to understand their functions. To use your location to get directions, simply click the “Directions” icon in the map’s upper left white box. In that box is also “View Larger Map” which will load the location on the Google Maps website. This is the page you can bookmark on your computer or phone. This will let you get to your map with just one click. 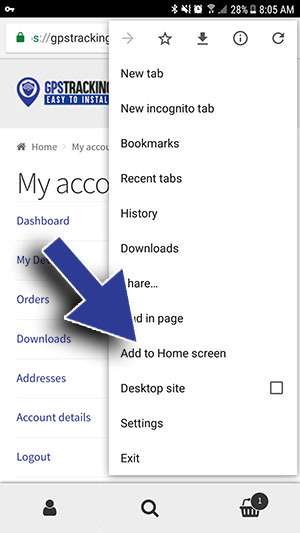 For Android phones, when you’re on the map page, click the browser options menu and select either “Add to Home Screen” (Chrome mobile) or click Page then “Add Page Shortcut” (Firefox mobile). For Apple phones (Safari), click bookmark/box-and-up-arrow icon then Add to Home Screen. Rename it to whatever you want it to say. 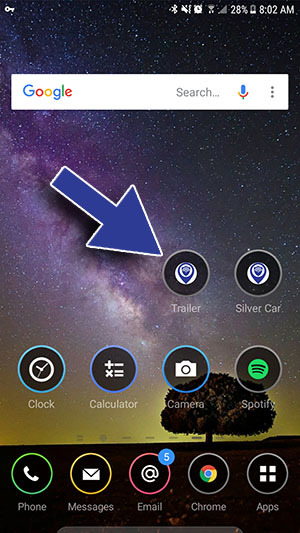 These shortcuts add an icon to your phone’s home screen to allow one click access straight to your map (assuming you’ve checked “Remember Me”). Our system also allows for you to choose a time in the past and it will retrieve and display the location closest to that time. This is verified by the Location timestamp (red arrow). For now, our policy is to save location data for at least one year into the past. 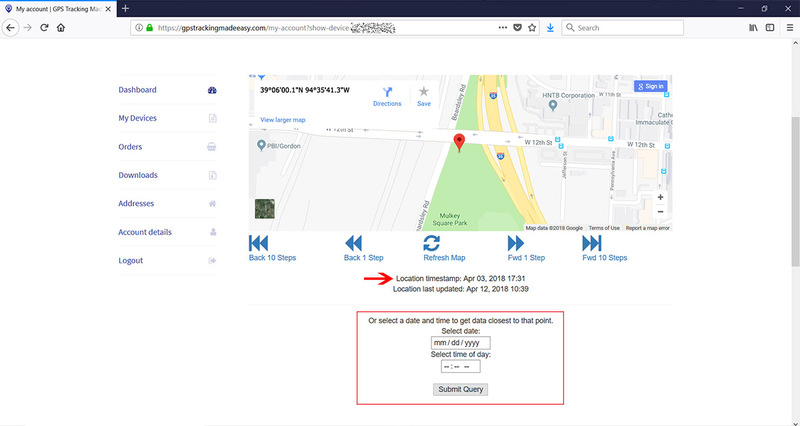 From wherever you are in time, you can navigate forward and back using the blue arrows under the map, or enter a new date and time and try again, or Refresh Map to return to the Location last updated. We’ve tried to create our system to be as intuitive as possible, but we still want to improve. If you have any questions about how to best work our system or any suggestions, you can send us a private message on Facebook, text us at the phone number at the bottom of this page, or send us a message.